Reading poetry, at sunset, beneath the pine tree. 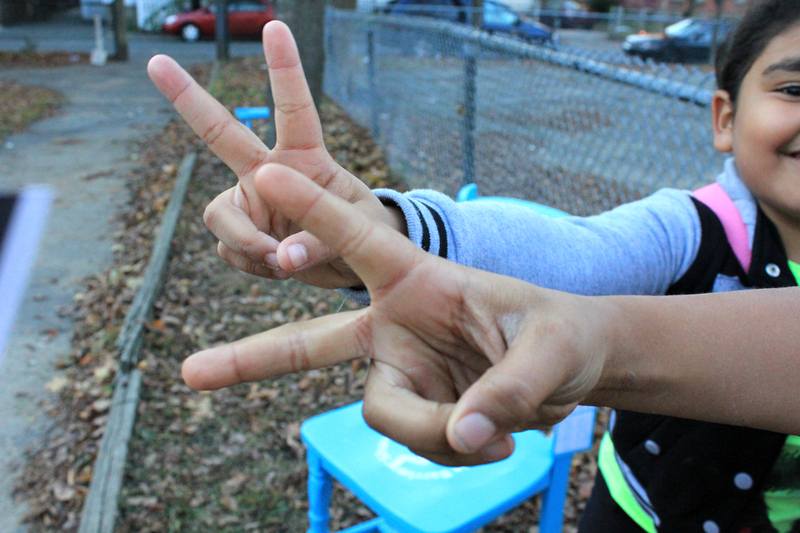 Share a Chair is an attempt to place something in a space to begin a dialogue, to say “hello.” It is an offering, and in this case, we offered bright blue painted chairs and poetry. The half mile march to the park. 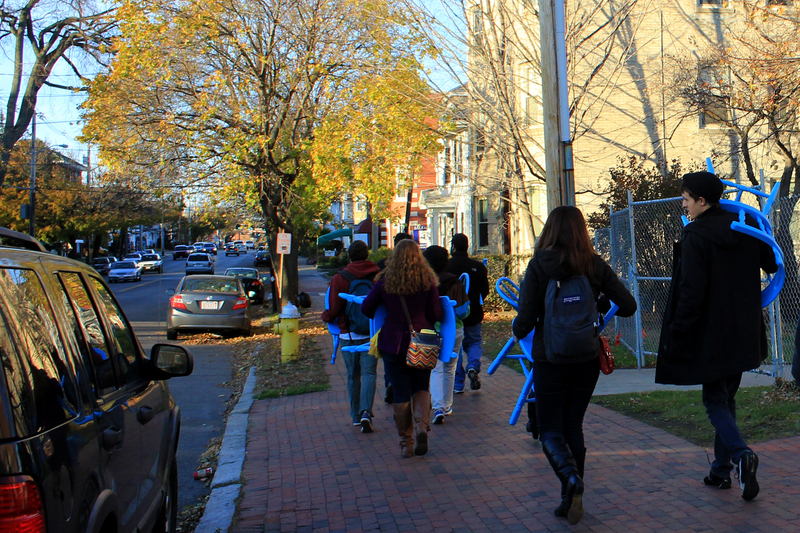 On Saturday afternoon, over a dozen participants marched these nine bright blue chairs down Lafayette Street, a main thoroughfare, to Mary Jane Lee Park in Salem’s Point neighborhood, a small park unknown by most residents outside the area’s borders. 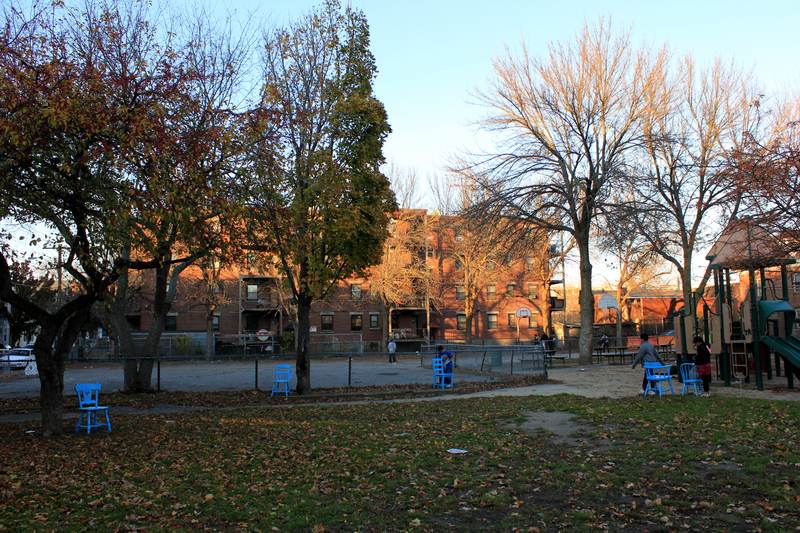 Within the neighborhood, Mary Jane Lee Park is considered the heart of the community. 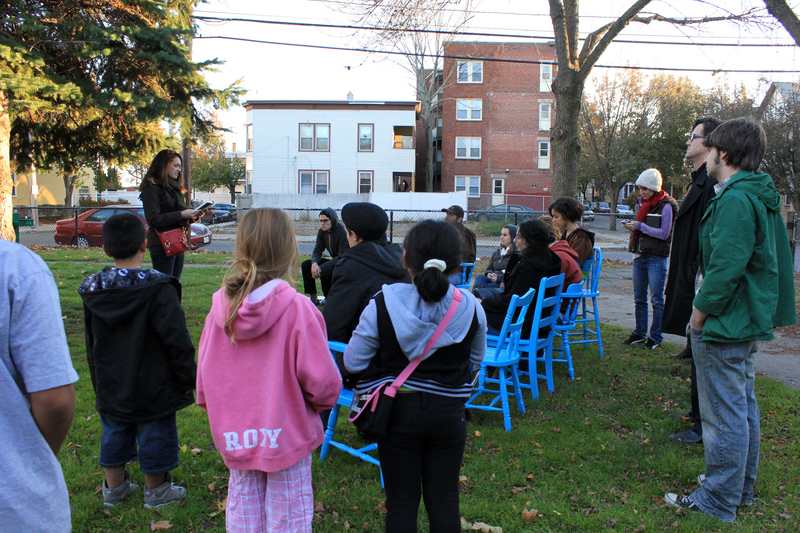 As participants set up the chairs, I invited the middle-school aged children by the swings to join and listen; it was the small kids that came. They were instantly engaged. One girl asked me if this was to happen every day. Some made noises, others quieted them. They wanted to read, and sing but they were too shy. I am sure if we could stage this more than once, they would eventually participate. 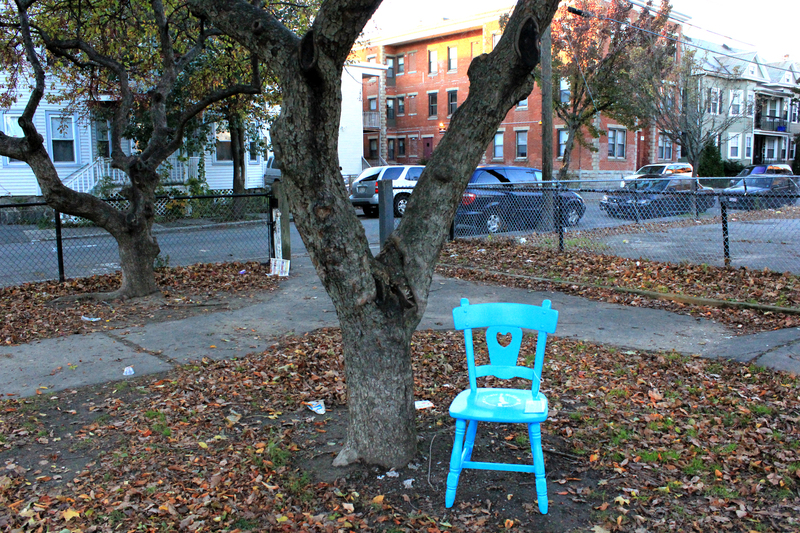 After the readings, participants named the chair they had carried over, and placed it in the park, in a space that seemed to need a place to sit. The idea to offer chairs came to me as I researched the park for an article, and I learned from one of the residents that benches had been removed from the park to discourage use by undesirable people. 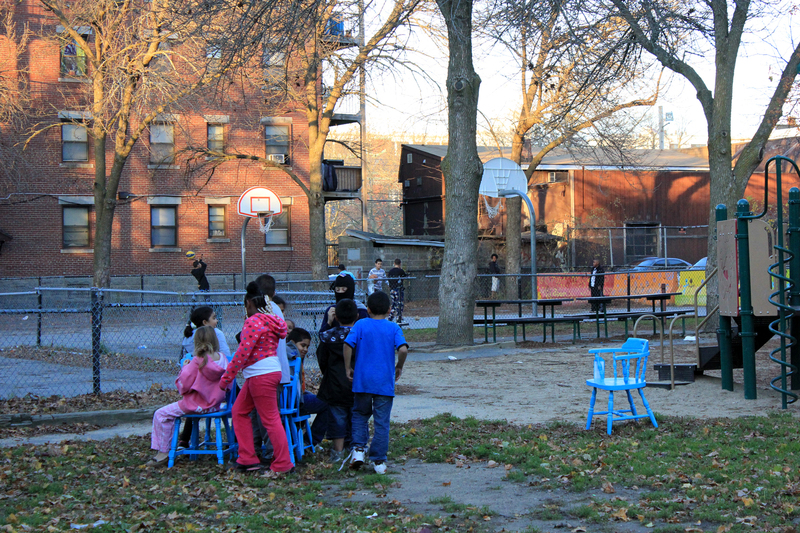 For sitting in the park, two benches by the playground remain, and five picnic tables chained to three trees. The chairs would be flexible, to be placed at will. The children inspect the chairs. But overall, they thought it was a good idea! They quickly appropriated the chairs for a game of musical chairs. 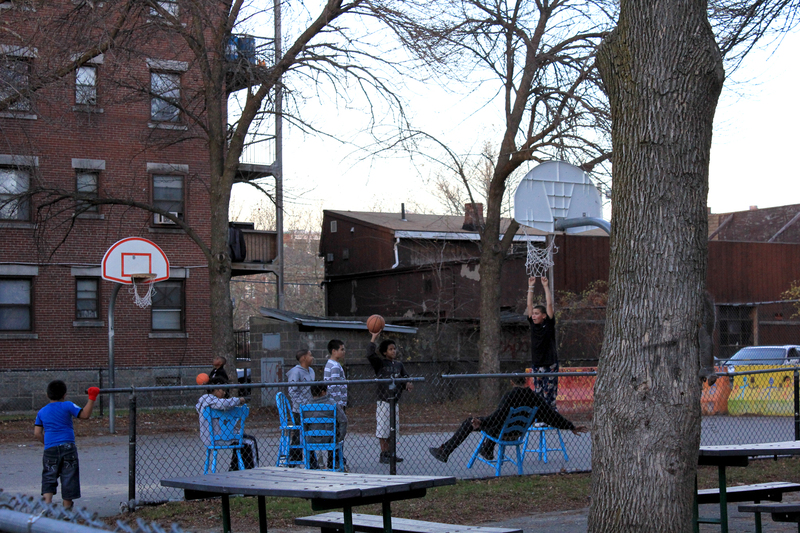 Then the older kids took them to watch the basketball game underway. 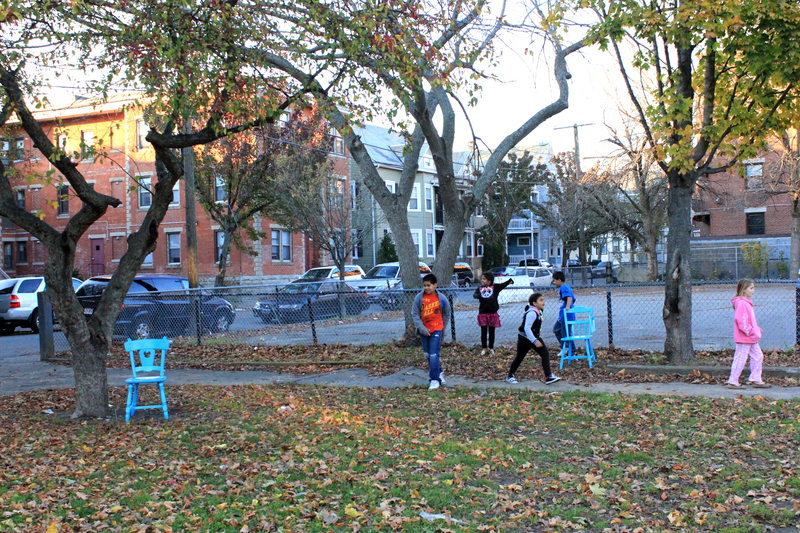 The chairs were successfully offered and belonged to the park to use or destroy. This entry was posted in Participate, Public Space Actions, Public Spaces, Salem MA, The Point, Uncategorized by jellybeancity. Bookmark the permalink.